Through a series of exhibitions and events, art students are injecting the gray expanse of Tokyo’s central east business district with some color and life. The Higashi-Nihonbashi and Bakuracho neighborhoods, an area characterized by rundown buildings housing small business offices, bland new mansion towers, and cheap wholesale clothiers. 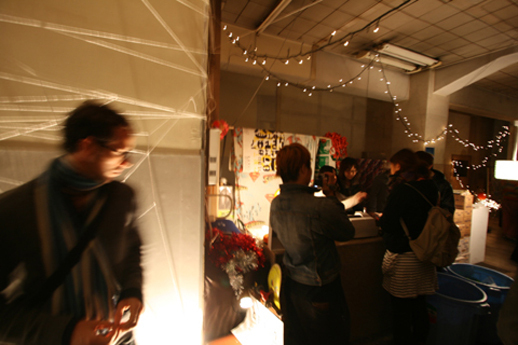 Economic decline has led to low rents and numerous vacated spaces, a trend which has inspired some Tokyo-based creators (who were in turn inspired by neighborhoods such as New York’s DUMBO) to gather in the area with the intention of using their collective artistic powers to revive the neighborhood. 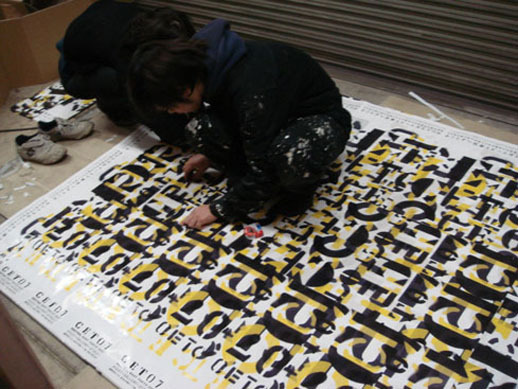 Central East Tokyo (CET) began in 2003 as Tokyo Designers Block Central East, the cross-town component to the design festival that would later become DesignTide. Riffing on the original design concept, the TDB-CE organizers re-designed a handful of vacated office buildings into temporary gallery spaces and thus created a scrappy, experimental, art-leaning alternative to its established counterpart. The following year CET reappeared as an independent event looking specifically at remaking vacant buildings, increasing the presence of creative people and spaces in the area, and linking the cultures of the past and present through building ties with the local community. 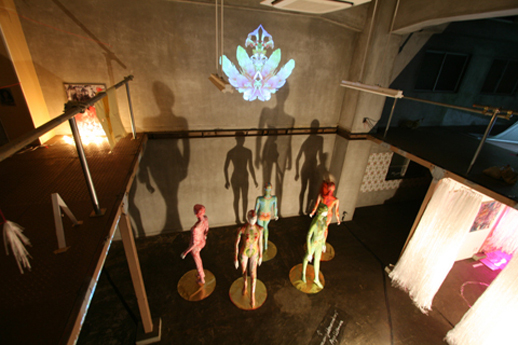 Different approaches over the years have seen the event grow and shrink, search for more permanence, and spin off other projects, such as the “Untitled Wednesday” series of events at the regular (but independently run) CET venue, “Untitled Night Gallery” (UNG). The theme of this year’s 10-day edition is “Street X Night X Gallery”, which intends to give a nocturnal element to day-time institutions, namely the office buildings whose interiors and exteriors will serve as galleries and, therefore, maximize the usage of these structures. In contrast to previous years, most venues this year are open only in the evenings, following the idea that while artists or others engaged in unconventional pursuits might be free to visit galleries during the day, most functioning members of society are not. CET 07 aims to create an art scene that fits into the daily rhythms of the city, and by doing so includes cafes, bars, and live performances on the agenda where visitors can add art appreciation to their regular nightly pursuits. 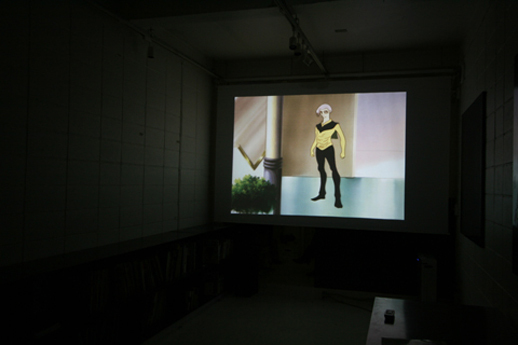 Videos projected on the walls of buildings serve both to liven up the cold walk home (or to the next venue) and as a communal alternative to evening TV. Producer: Naoki Sato, Art Director for ASYL and part of the curatorial team for Mori Art Museum’s latest exhibition, Roppongi Crossing. 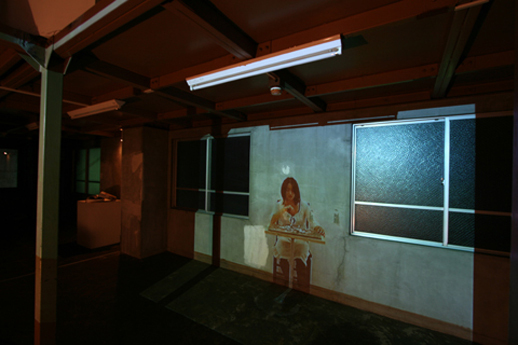 Directors: Coalition of alternative-thinking professionals, including curator Keiko Ikeda. 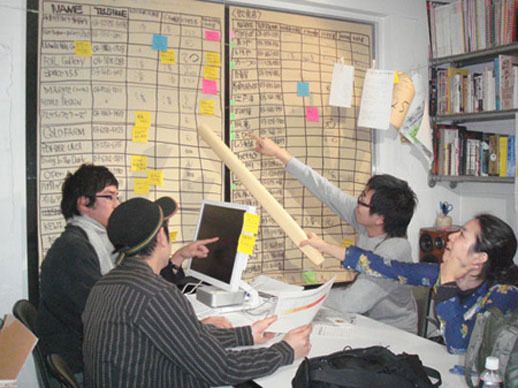 RealTokyoEstate: Unconventional real estate agency that helps CET track down vacant buildings with sympathetic owners. 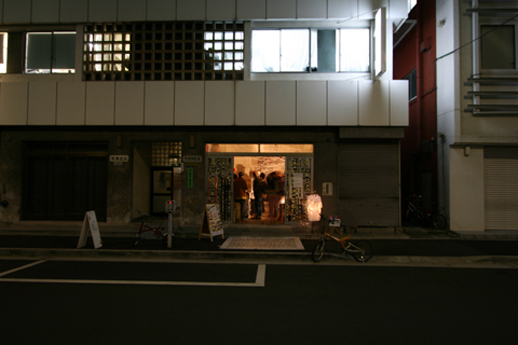 Artists: 80 creators, mostly young, who include photographers, video artists, animators, musicians, graphic, product, and fashion designers, some of whom live locally in the neighborhood and a few who are coming from further locals, such as Nagoya or Osaka. Interns: 100+ volunteers, mostly art students but also local housewives, restless IT developers, and other assorted professionals with an interest in art; led by Tetsuo Hashimoto. While the directors meet regularly to bat around ideas, the couple months before the scheduled event is when preparations begin in earnest to secure locations and equipment, contact artists, and recruit volunteers. However, since the event depends on the unpredictable nature of donated time, space, and materials, many decisions will be pushed to the last minute. Two Weeks Before: Locations have finally been (relatively) secured and preparations begin to turn the unused buildings into galleries and gathering spaces. The collective work of weeks of mailing list correspondences has resulted in the accumulation of assorted supplies needed to run the event. CET has no economic sponsors and relies purely on the donation of goods and services; for example the printing for flyers, the 20-odd projectors needed for the planned video installations, and the cake for the café were all donated by acquaintances sympathetic to CET’s agenda. The pre-opening festivities began as a man descended into a custom-designed hole created for him by local artist Keijiro Niino in a vacant lot near the main CET venues. 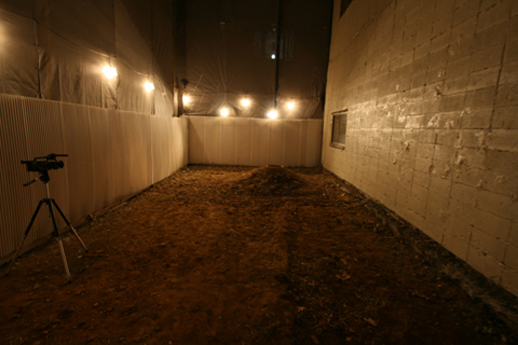 Niino’s performance piece, which he is documenting and posting on YouTube, demands that the hole-dweller stay in his lair for 72 hours, where he will sleep, eat, take care of other bodily functions, and most likely be very, very cold, while being occasionally observed through the anthill-like entrance by visitors to the event and the media that the performance attracted. See excerpts from the 72-hour action here. Ironically, the opening party in the café on the ground floor of one of the main buildings is one of the earliest scheduled events, starting at 16:00 and scheduled, to finish before the official opening at 18:00. The café serves as a kind of clearing-house for the event, where visitors can pick up maps and schedules and hot drinks before heading out to troll the neighborhood for the scattered exhibitions. With the mismatch of genres thrown together in a small space, it is hard to draw conclusions about the exhibition. Also, the venue, being a symbolic statement itself, must be considered along with the pieces. It is impossible not to look at CET in comparison with the recent DesignTide, the latter being a product of corporate sponsorship, coverage in glossy magazines, and a lot of visiting Swedes. 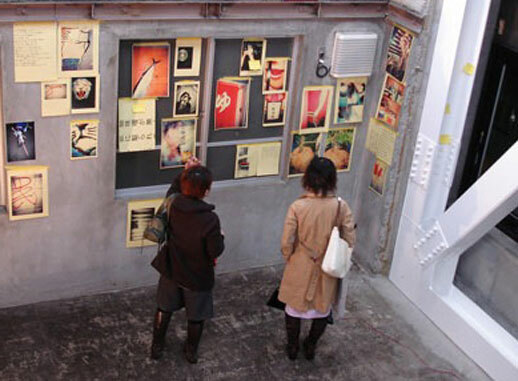 The DesignTide Extension element also has visitors taking to the streets in search of temporary exhibitions, these ones taking place in the posh boutiques in Aoyama, Tokyo’s mecca for design consumerism. While the various events during the DesignTide week sparked some consideration along the lines of “where are we taking this design thing?” to the point of thinking “maybe it does seem a little commercial and frivolous,” to its credit, the event receives thousands of visitors and seems completely at ease in its adopted locale. DesignTide feels like an event, and there being lots of people and free champagne probably has something to do with that. On the other hand, the opening night of CET was attended primarily by the artists and staff themselves, their friends and extended circle reached via word of mouth. There was no free champagne, though artists and staff got a free beer. This is a no-budget underground event, with all the trappings: live performances in low-lit basements, raw lighting, borrowed interior items soon bound for the curb, shabby college students, and a general atmosphere of irreverence and lack of pretension. The fact that it is dark outside (and the absence of neon in the old neighborhood means that it is really dark) only heightens this effect. By the same logic that you wouldn’t go to a play on opening night, CET’s inaugural evening was a little harried and one can anticipate that as the week progresses remaining kinks will be ironed out, though the roughness is part of the aesthetic. Walking the streets that first night, however, I was surprised, and a bit discouraged, by the absence of people in general, except for the few young people walking around with obvious exhibition maps. It’s a Friday night: surely some people should be going out? CET’s biggest challenge, intern leader Hashimoto explained, is making the exhibition and the small new artistic community part of the larger, older one. CET is a work in progress, and an element of the exhibition is to gage and display that level of progress. Visitors from last year’s edition will notice the new Foil Gallery with a café now open in one of the buildings being used this year by CET. Also, the Untitled Gallery (UNG), a regular CET fixture, will operate on a year-round basis from this month, which is another example of progress in making CET’s formula work towards more permanent transformations. During the course of the weeks that I made the commute from my own neighborhood to central east Tokyo to work with the CET team I created my own attachments to the area, in the form of new favorite lunch and coffee spots, as well as to the people involved in the event, a community of creators who meet up regularly throughout the year to discuss and play. Moreover, participating in the event was fun, which is why over half of the interns are making a return appearance; many hang out together outside of working on the event and some have even relocated to the area or are thinking about it—all of which bodes well for the sequel. Central East Tokyo runs until December 2 with most venues being open between 18:00 and 22:00. Events vary so check the website, www.centraleasttokyo.com/07 for details. Exhibitions are accessible from Bakura-Yokoyama, Higashi-Nihombashi, Shin Nihombashi, and Kodenmacho stations. 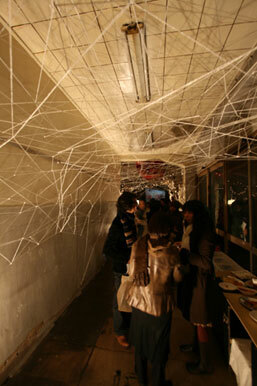 To get started, visit one of the main venues, such as the Agata Building or the Untitled Gallery, and pick up a map. All venues are marked with CET07 posters and have friendly interns posted out front.